Goldhammer touched on a wealth of points during his initial remarks at UCSD. Yet he chose to focus on the astounding first round election results (held April 22nd), dedicating a good deal of analysis to explaining the high turnout for radical right National Front candidate Marine Le Pen. Early polls showed her receiving 20 percent of the vote, but she ultimately emerged with 17.9 percent. This is the highest turnout for the party to date, and Goldhammer did not conceal his disdain for Le Pen and fears for the future successes of the party. While Marine Le Pen, did not win the race, her success illustrated how the domestic economic and social issues that she addressed in her campaign – notably her stance on anti-immigration – are becoming increasingly accepted by the French populace. Why is a candidate whose main policy points include expelling immigrants, adding 15,000 more jobs in law enforcement, and re-affirming the ideal of secularism first espoused in the late-19th century by the Third Republic winning over millions of French people? While the frontrunners Sarkozy and Hollande addressed international monetary policy and the recent Euro-crisis, Le Pen’s rhetoric honed in on problems rooted domestically: notably the chronically high unemployment levels for the working class. Her appeals to national identity were equally steeped in a stance against immigrants. Le Pen was the most straightforward in blaming the country’s high unemployment in low-skilled industries on the presence of North African and Arab immigrants. But she has not been the only one criticizing the presence of immigrants: Sarkozy also stated on a national television program that aired March 7th, as part of his calibrated pivot to the right, that there were “too many foreigners” in France (Goodman). In tandem with claims that these immigrants are practicing a form of fundamental Islam, fueled by events such as the recent terrorist attack by a Muslim immigrant on a Jewish primary school, there is growing political pressure to address the issue of immigration. The closeness of the vote thus reveals a split in the French electorate, as France moves from its position as a nation that once enthusiastically embraced the challenges of modernity to one that increasingly turns back to traditionalism in the form of religious faith and nationalism. American liberal media had a decisively negative reaction to the stance of Le Pen and Sarkozy on immigration. However, these debates long preceded this election cycle. The decline of France as an economic center has challenged French modernist identity while fomenting social unrest and the resurgence of traditionalist identity spaces like fundamental Islam and ethnic French nationalism. A historical analysis of the relationship between modernism and traditionalism in France from the Third Republic to the present sheds light on the current destabilization of identity, and ultimately the political sphere today. The current situation of contemporary France, specifically the rise of French modernity, first found expression in the ideals of the Enlightenment, later refined in the crucible of the French revolution, and ultimately articulated in the late 19th and early 20th century by the Third Republic. Once a nation ruled by kings, France’s political sphere came under the influence of a secular government in 1870 with the creation of the Third Republic. Espousing the ideals of the French Revolution – socialism and republicanism – this new government resulted from a democratic election, and advanced the welfare of the State and its people. The major resulting rupture in this new system was a break from the influence of the Catholic Church. The process of separation from the Catholic Church peaked on December 9th 1905, with a law clearly stating the separation between the institutions of Church and State: “The Republic does not recognize or financially support or subsidize any religious denomination” (Fortescue, 73). This “Separation Law” severed financial ties between the French Republic and the Church, seized property from the Church, and banned religion from being taught in publicly funded schools. Moving forward, the freedom of individuals to practice religion was still protected, but with a clause giving the State power to restrict expression in the interest of “public order” (ibid). The move to a secular system of government was arguably the most controversial aspect of France’s leap into modernity. Its strong secular position would also become a major source of in-fighting and national debate in years to come. This rise of French-specific modernity resulted from a confluence of identifiable historical changes. Notably, the opening of capitalism to the non-aristocracy played a major part in the French Revolution because the “nouveau riche” bourgeois used their resources to challenge the existing order. Other processes like urbanization, which broke from gemeinshaft and older forms of capital accumulation, allowed for the reconstruction of identity and the duality of private and public lives. Enlightenment philosophy was a rejection of the Church’s hegemony over institutions of thinking. Technology and science challenged the knowledge base and led to a shift in paradigm. Individualism, the division of public and private, democracy, enlightenment philosophy, capitalism, imperialism and the global economy culminated in a rich sense of modernity (Friedman). The confluence of these alternative ways of identification and the breakdown of traditional structures in the nineteenth century facilitated a move to new, “modern” structures. To expand on the economic machine driving France’s transition into modernity, it is important to realize that through the nineteenth century and into the twentieth century, France was a center of trade, production, and economic activity. The period of heavy colonization in Africa and Asia during the early 19th century placed France in a strategic position, and with a GDP second only to Britain, the nation had become a world power. Within a global systems model, France had created a successful economic hegemony – although only partial, since it was in constant competition with Britain. As a center, France became a production hub for the accumulation of wealth: it owned the means of production in the form of factories and therefore controlled the economic processes. As France was flooded with resources, it developed and grew, reinforcing its identity and position as a modern nation. Further, exporting goods to the U.S. and less developed European states, served to further consolidate France’s economic position – by 1899, France’s share of global exports reached 14.4 percent (Table 3.3, Friedman). Such new economic, social, and political elements created a cultural hegemony around what was perceived to be a new, “modern” nation. Importantly, the expulsion of the Catholic Church from government diminished its role in people’s lives and education. Religion had been entrenched in the French identity for centuries, but suddenly the Church lost most of its legitimacy when the Third Republic cut off its connection with the State. The vacuum left by religion was replaced by republican ideals. Religion, class, and ethnicity no longer defined what it was to be “French” in the official language of the State, and this attitude created a similar change in the minds of the French citizenry. A prevailing sense of national identity took hold, fueled by the prosperity of being a center and structures, which promoted “liberté, egalité, fraternité.” In particular, the education system revolved around the teaching of republicanism and therefore became a mode of inculcating children with a set of values and ideals based on the new State ideology. The post-war boom funded by the Marshall Plan helped rebuild the nation and created a sense of unity, but in the 1970’s economic conditions plummeted. The Bretton Woods system of fixed exchange rates collapsed, and the oil embargo imposed by Arab nations on Western states during 1973 and lasting through 1974 resulted in an unprecedented increase in the cost of energy. The entire region suffered as the “average rate of growth of the European countries was only 1.6% in comparison with an average growth rate of 4.6% in the previous decade” (Kouri, Macedo,Viscio, 88). France’s GDP growth during the period of 1973-81 was 2.6 percent, over a 100 percent decrease from its rate in the preceding decades (ibid). The decline in manufacturing growth was even more stunning: from 5.8 percent in the post-war period to 1.7 percent from 1973-81 (ibid). Whereas unemployment was at 2.6 percent in 1973, by 1981 it was close to 8 percent, over a 300 percent increase (ibid). These economic statistics paint a picture of the rapid deterioration of the French economy in the 1970’s. The economic situation deteriorated even further in the 80’s and into the present. Unemployment rates have been above 6.9 percent since 1983, reaching its peak of 11.3 percent in 1994 and 1997 (Google Public Stats). France’s “share in automobile markets fell from 30.4 percent to 24.3 percent in 1983, whereas the share of foreign cars in France rose from 21.7 percent to 32.7 percent (Balassa). During the same period, the combined losses of the Peugeot and Renault groups increased from 1.2 milliard to 4.3 milliard francs” (ibid). Even in these conditions, the socialist government increased wages and social benefits, and even avoided firing unneeded workers. Despite the poor performance of France’s heavy industry, structural adjustment was postponed in favor of appeasing labor unions and the French working class. The driving force behind the economic crisis in European countries like France and Britain was de-centralization, specifically the movement of industrial production and capital to Third World nations. Countries like Brazil, Iran, South Korea, Singapore, and China were assuming increasingly large portions of the world’s production as France deindustrialized. Production became too expensive as both wages for workers increased and inflation grew, so French capitalists began investing in cheaper labor in Third World countries. This resulted in the de-accumulation of wealth at the center. Another element, which compounded with de-industrialization to weaken France’s economy was growing consumption among the French population. The combination of fewer exports and more imports created a trade imbalance. And since the French economy was stagnating due to large-scale crises (i.e. Bretton Woods and oil embargo), the imbalance led to debt and inflation. As a result, competition grew between Western nations, which further reinforced capital investment abroad. The new vulnerability of the French economy challenged more than its economic hegemony: it fragmented the national identity and modernity, which had prevailed for almost a century. Because the processes of hegemony and modernism were so inter-connected in the French case, the two phenomena were both in moments of crisis in the early 1970’s. At the level of the French individual, there was a crisis, a psychological reaction to the realization that his or her current identity – which was so steeped in republican ideals – was somehow insufficient because of the poor economic condition of the State. Historically, this process usually ends in, “The re-identification of the subject with the larger project, while eliminating the ego-project and submerging the subject within the dictates of the group, simultaneously provide a newfound meaning in life and an ontological security” (Friedman, 253). Ultimately, the French individual was subsumed into larger groups and movements: ethnic, religious, socialist and nationalist. It should be noted that this identity formation can be contradictory on an individual level – so elements of modernism and traditionalism can intermingle in important ways, as will be discussed. As illustrated, at the core of French modernist identity is the notion of secularism, and this soon came under attack by those most affected by the economic decline: the immigrant population from ex-colonies in Africa. Immigrants from Algeria, Tunisia and Morocco numbered in the millions in France, a large percentage of which are Muslim. In a secular country whose policies strictly prohibited public displays of religion, the new Muslim community had to negotiate its presence by keeping to itself. But the economic crisis brought a host of conflicts, and France’s second and third generation Muslim community experienced “re-ethnification” in the form of fundamentalist Islam. The emergence of a French nationalist movement from the far right of the political spectrum occurred simultaneously, and these two movements began to clash. The local conditions of France’s economic decline, in tandem with global processes, led to the surge of France’s Muslim community. High levels of migration to the France, which only recently became a contentious political issue, have been a reality for the country since the early twentieth century. Due to labor shortages after World War I, France recruited mostly Italian and Spanish laborers for seasonal and year-round work. The Gaullist pronatalists, led by Charles de Gaulle, ensured that these waves of immigrants were compatible in ethnic terms. In the post-WWII period, this policy changed: the Ordinance of 1945 rejected the notion of recruiting foreigners based on ethnic or religious preference. So while the proportion of foreigners in France hasn’t increased percentage-wise – in 1931 it was at 6.6 percent, in 1982 it was at 6.8 percent – it has changed in its geographic composition and ethnic make-up (Hollifield). Token migration from African colonies to France occurred in the early 20th century, but the major flows began in the 1950’s with exoduses from ex-colonies like Algeria and Tunisia. This wave of immigrants came to France and were greeted as outsiders by the French populace because of their skin color, odd French dialects, and unknown social customs. However, official policy was non-discriminatory such that religious freedom was respected. The limits on religious freedom had remained constant though: French law prohibited proselytizing, public displays of religious affirmation, or State preference for any religious organization or events. The new immigrants were initially accepting of these restrictions, despite the laws being viewed as contrary to their religious practice. Muslims went to mosques and practiced their religious bonds in private, and actively coordinated their activities with local governments. In addition, the State-sponsored modernist identity was widely accepted by France’s Muslim community, just as it was by other religious and ethnic communities. Because of the strong foundation of republican values during these first waves of migration, the secular policy of the government was respected. In the 1970’s, a completely different attitude towards these laws was growing. Youth in the “banlieues” of Paris and across France began revolting against the secularist and anti-communalist stance of the government. New public shows of Islam challenged the social and cultural norms. Recent examples of a changing attitude towards religion in France among its minorities included the wearing of veils in public institutions and building taller minarets. These actions represented the rise of traditionalism, and a breach of the immigrant’s acceptance of the modernism espoused by the State. Resistance was overtly public, as it used visible religious symbols like the hijab to convey a sense of dissatisfaction with restrictions of religious practice. By skirting a thin line between freedom of expression and the State’s definition of proselytizing, Muslims were in essence bringing into question the ideals of the Republic. The state provides Muslim chaplains and serves rations in accord with Islamic dietary law to believers in the military and in prison. Business and industry offer Muslim employees time and facilities for prayer. Some 30,000 of France’s Muslims go to pilgrimage to Mecca each with year, with official blessing (80). These concessions won the French government short-lived relief from the demands being made by Muslims. But ultimately, they were symbolic compromises, neither integration nor the kind of change being advocated by the Islamist faction. We can begin to understand the underlying logic behind the Islamification of France’s Muslim population through an examination of immigrants in the French economy. Immigrants arriving from Africa are low-skilled laborers, with only 4 percent of Algerians and 6 percent of Moroccans holding jobs in the professional sector (INSEE 1997). This means that the immigrant population’s economic well being is tied to unskilled positions in the agricultural and production sectors. During the industrialization of the post-WWII period, immigrant labor was in demand for low-skilled work in French factories, resulting in a lax immigration policy and sizable inflow of immigrants. Since the 1970‘s, these industries have been greatly diminished with the majority of production being outsourced to developing nations in the Third World. The flood of “temporary” immigrants over several decades was still in France though now obsolete in the contracting economy. Unemployment rates nationwide soared to levels where over 1 million people were out of work. Of the ranks of unemployed, the largely unskilled immigrant population and young people were being disproportionately affected. A look at today’s unemployment rate – 23 percent for workers under the age of 25 – gives a barometer of the kind of economic straits in which young immigrants found themselves (Erlanger). It is no wonder then, that the young immigrant population became the face of anti-government, anti-secular, and anti-assimilation movements. Young, second-generation immigrants also happened to be the demographic, which identified most with Islam in France. The disillusionment expressed by the children of Arab and African immigrants stemmed in great part from their dismal economic prospects. As individuals, they were powerless, but as a group, they felt empowered and emboldened to express their economic needs. The violence exhibited by the group, in the mass burnings of cars in Paris on New Year’s Eve for example, was (and still is) “a subjective solution to fear” (Friedman, 257). Thus the fear of complete economic disenfranchisement was in part what fueled the movement. These young people were in need of both economic and ideological support, and they found these resources not in the republican institutions of the French Republic, but in their local mosques. It is no coincidence that “North African immigrants in France only really started to set up Islamic institutions and open mosques in the mid-1970’s” (Kepel, 150). At the onset of the economic crisis of the 70’s, the mosque offered ideological sustenance for those frustrated by their low economic position and what they perceived as government apathy – but what was actually France’s secular stance. It also provided a place to network for young people with similar experiences. For those feeling rejected by the French system, Islam provided a framework of understanding, through the teachings of the Koran. The crisis of modernism, channeled through secular institutions, was interpreted as a vacuum that could be filled by Islam. Thus a new sense of purpose emerged from the immigrant’s new religious ties to Islam, one, which filled the void left by the crisis of modernist identity. The mosques and cultural institutions played an even more fundamental role in the lives of these unemployed or underemployed immigrants: they provided social welfare. Government policies and social welfare programs aimed at immigrants failed to meet the new demands of unemployment. France hoisted a set of “anti-racist programs,” which attempted to integrate Muslims in French society without directly supporting their main source of cultural identity – the mosque. “Even the clearest-sighted associations, like SOS-Racisme, were incapable of fulfilling (their functions), and frustration at their lack of success was all the greater because of their proximity to the ruling Socialist Party…” (Kepel, 175). When these program collapsed, mostly due to their lack of financing from the government, these special programs were abandoned. For immigrants who weren’t naturalized, the general welfare system was inaccessible, so the mosques began filling a role typically handled by the government. One example of this was in its rehabilitation of drug addicts in the banlieues of Paris. In one such neighborhood, Nanterre, drugs were responsible for 30 percent of deaths among youth. Young people found routes out of drug use, through the mosque (Kepel, 209). At large, the proven inability of the French government to meet the needs of the immigrant community created an opportunity that was quickly filled by the mosque and Islamic institutions. Since France’s strict separation from religious affiliations prevented it from supporting mosques with State money, Islamist nations and ex-colonies took on this economic burden. The ideological thrust of those funding French mosques helped spread fundamental Islam to French mosque-goers. Even the Paris Mosque, which had institutional ties to the government, was funded entirely by the Algerian government. Muslim networks that were left unfunded grew out of a grassroots approach, through makeshift mosques in nondescript warehouses. The international networks of Islam took advantage of the government’s non-involvement with the funding of Muslim institutions by funding the growth of the Islamist segment of France’s Muslim population themselves. The Saudi Arabian government and its elite, freshly rich from exploiting its natural oil reserves, were hoping to garner support. The clearest examples of Saudi influence in France are through its direct financial support of mosques. The largest mosque in Paris (measured in square footage), known as Addawa, was funded by Saudi Arabia in the 80’s. Another example was a controversial mosque built in Lyon in the early 90’s (Viorst, 91). By funding these projects, the Saudi Arabian government ensured that the practice of Islam in France remained and grew, despite the perceived assimilationist policies of the nation-state. The explosive growth of mosques in France – from a dozen to more than 1,000 over a span of several decades – has been a direct result of foreign influence from the Saudis and other Islamist foreign influences. The rise of traditionalism through fundamental Islam was poorly managed by the French government, and this compounded its growth. Government reaction to what is commonly referred to as the “veil incidents” – in which several young female Muslim students refused to participate in classes, which required them to remove their veil – was riddled with indecision. The State did not waver on its republican ideals and ended up ruling in favor of secularism and against freedom of religion. When it required the schoolgirls to abide by their school’s rules, the Republic sent a message to its immigrant community that secularism in public life was more important than certain freedoms. And when faced with how to handle the treatment of religious symbols in schools, the government left decisions to local educators. This decision highlighted the weakness – or indecision – of the government in enforcing its policies on a national level. The Muslim minority analyzed the veil incident and concluded the only way to practice their religion fully would be to vocally reject assimilationist policy. Consequently, today the prominence of the veil is increasing, as more and more women are being empowered to express their Islamic identity by their families and communities. This kind of local political struggle between France and its Muslim immigrants is closely connected with global systems and France’s ties with ex-colonies. The growth of an Islamist movement in the crown jewel of France’s old empire, Algeria, helped fuel a revival of Islam by providing a blueprint for local struggle. The outwardly anti-French and Islamist party (Front Islamiste du Salut) in Algeria had surprising successes, culminating in the electoral victory in 1991. “By blaming all of the country’s ills on French cultural influence, the FIS heightened a sense of ’pure’ Islamic identity, from which the party wanted to exclude all the intellectual and linguistic contributions made by France…” (157). FIS became a sounding board for anti-modernist ideology. It also became a blueprint for Islamists in France to challenge the secularism in their society. Starting in 1982, FIS publicly demonstrated at the University of Algiers against the FLN (Front de Liberation Nationale) regime – which had institutional backing from the French government. Sunni mosques began “blaming misery and injustice on the ungodly political regime…” and providing education for poor Muslim youth (Kepel, 167). These strategies were transplanted from Algeria’s Islamic networks, and then reproduced in France. The global Islamist movement, especially the struggle against the political remnants of French democracy in Algeria, was informing local movements in France. Additionally, many other global events have importantly impacted the expression of Islamic identity in France. The Iranian Revolution of 1979, the Rushdie Affair of 1989, and the Gulf Wars and the recent “Arab Spring” are all factors in the growing religious identification among Muslims in France. ‘to represent Islam and Muslims in France and defend their interests’…To this end, the UOIF intends to negotiate with the public authorities in order to win various legal concessions which would give the ‘community’ a form of autonomy within the French society compatible with the ‘principles of Islam’, as defined by the organization (Kepel, 195). No matter how carefully UOIF treads in French politics however, its actions are being critiqued. Its connection with Muslim Brotherhood is tantamount to partnership with radical Islam in the minds of many conservatives. In the minds of the socialist left, the UOIF is simply trying to carve out a space for religious practice in a nation, which doesn’t officially recognize any religious affiliations. The rising political legitimacy of Islam’s proponents has been met with staunch resistance from more than just the conservative party. A poll taken in the early 90’s “found that two-thirds of the French associate Islam with religious fanaticism” (Viorst, 80). Separating Islam from fanaticism is becoming increasingly difficult, as terrorist attacks in France and Britain – including the murders of four Jews and two soldiers by a young Muslim extremist trained in Afghanistan in March – have been connected with the international Islamist movement. Many Muslim groups within France are attempting to fight these negative perceptions, but they are hard pressed to convince media outlets of their moderation. This anti-Muslim sentiment has quickly boiled over into anti-immigrant rhetoric. The anti-immigrant ideology has been articulated best by Le Front National (“the National Front”). Their founder and leader (until his retirement several years ago) was Jean-Marie Le Pen, and he was known for advocating radical measures against France’s three million Maghrebians – most notably repatriation and segregation (Hollifield, 193). After initial success at the local level in 1984, Le Pen led his party to national elections, in which he received strong working-class support for his single-issue platform of immigration reform. In legislative elections, the National Front gained thirty-two seats in the new Assembly. In 1988, Le Pen won 14.5 percent of the first round of the presidential race. And in a 2000 public opinion poll, 60 percent of respondents “saw immigration levels as too high” (210). The increase in anti-immigrant sentiment was marked by the growing success of the National Front at the polls: with the party receiving almost 16.9 percent of the first round vote in 2002. It is very clear that the National Front played— and continues to play— an integral role in the articulation of a French ethnic identity and the backlash against “foreign” North-African and Muslim immigrants. The rise of the National Front also coincided with a period of political turmoil, which underscored the weakness of the French republican system. Ever since the recession of 1973-74, attempts to curb migration were proposed and failed to varying degrees. One of the first major proposals from the Jacques Chirac’s conservative party was the “First Pasqua Law,” which hoped to make naturalization more difficult for African immigrants. Although Pasqua’s proposal ostensibly argued that integration should be apparent before citizenship was granted, the Council of State claimed it was unconstitutional and inconsistent with republican principles (ibid, 193). “Despite the almost continuous atmosphere of crisis in French politics over immigration, integration, and national identity, little had changed in terms of policy outputs or in terms of policy outcomes” (ibid, 198). Whether or not the policy recommendations proposed by the right passed, they still impacted the conscience of the nation. During the economic boom of the post-war period, the republican system flourished on consensus, but since the 70’s it has been plagued by divisiveness on the issue of immigration. This is undermining the government’s legitimacy among large segments of French society. I’m Muslim…When I walk into a mosque, I’m at ease. They shake your hand, they treat you like an old friend. No suspicion, no prejudices…When I see another Muslim in the street, he smiles, and we stop to talk. We recognize each other as brothers, even if we never met before” (91). Despite his terrorist connections, Kelkal became a martyr in the eyes of many French Muslims. He was painted as a victim of the French system, and his route to terrorism was seen as a failure of the government to properly address the issues faced by urban youth. The suspicion and prejudice of French society towards the new French-Muslims were palpable for Kelkal, as for many youth moving through their daily lives in French cities and towns. The French people’s stance against Muslim identity – and for a modernist worldview – could “blowback” as it did in the case of Kelkal. The increase of a more fundamentalist and radical Islam may be connected back to the xenophobic articulations of the National Front and what is perceived by Muslims as a populace in agreement with this kind of anti-immigrant, anti-Muslim rhetoric. The local experience for Muslims and immigrants in France is intimately tied to global systems of economic, political, and social varieties. From a historical analysis of the relationship between modernism and traditionalism in France from the Third Republic to the crisis of the 1970’s, and up to present day, it is readily apparent that the decline of France as an economic center led to a destabilization of social identification. The failure of the economy in turn led to the weakening of the modernist identity, and in turn to the revival of previously suppressed ethnic and religious identities. This process was compounded not only by the rise of global Islamist movements, but also by the French government’s indecision and perceived discrimination towards its immigrant community. The radicalization of rhetoric against Muslims and immigrants by the far right, and the increasing public association of Islam with fundamentalism served to further solidify the anti-secular, anti-assimilation Muslim identity. With the election of Socialist president François Hollande, there is a renewal of hope for improved economic conditions for France’s workers, and therefore the possibility of decreasing social tensions. Only a month ago as part of his campaign, Hollande spent several days on a tour of the “banlieues,” with promises including more jobs and social benefits. This is promising for the relationship between the government and disenfranchised areas. But French newspaper Le Monde pointed out that Nicolas Sarkozy did the same thing in 2008 (although only after his election win) and proposed similar plans – which were effectively never realized. 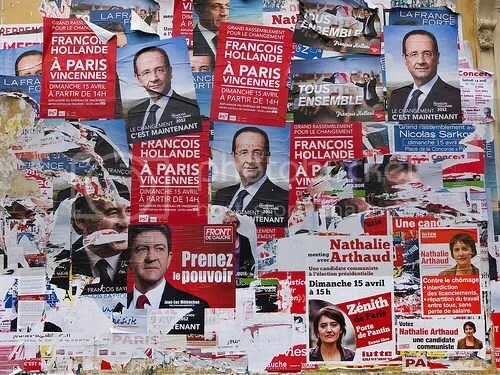 Whatever the case may be, these five years will be a defining moment for not only the effectiveness of socialist policies, but also the question of French identity. If the material conditions for the French working class deteriorate further, both Islamic traditionalism and French nationalism will grow and threaten to destroy any sense of unity. Politically, Le Pen and the National Front would then solidify its base even further, and take an even greater percentage of the first round vote. But above all, the social ramifications of the continued economic crisis are what loom largest for the state of France. Image by Flickr User KSDH, used Under a Creative Commons License. Bela, Belassa. “French Industrial Policy under the Socialist Government.” The American Economic Review , 75.2 (1985):315-319. JSTOR. Web. 21 Mar. 2012. Courgeau, Daniel, and Monique Lefebvre. “Les migrations internes en France de 1954 a 1975. II. Migrations et urbanization.” Population (French Edition), 37.2 (1982): 341-369.JSTOR. Web. 21 Mar. 2012. Erlanger , Steven . “French-German Border Shapes More Than Territory.” The New York Times [New York City] 3 Mar. 2012: n. pag. The New York Times. Web. 21 Mar. 2012. Fortescue, William. The Third Republic in France, 1870-1940: conflicts and continuities. London: Routledge, 2000. Print. Friedman, Jonathan, and Kajsa Ekholm Friedman. Modernities, Class, and the Contradictions of Globalization. Lanham: Altamira Press, 2008. Print. Friedman, Jonathan, and Kajsa Ekholm Friedman. Historical Transformations. Lanham: Altamira Press, 2008. Print. Gilbert, Felix, and David Clay Large. The end of the European era: 1890 to the present. 4th ed. New York: Norton, 1991. Print. Goodman, David J. “‘Too Many Foreigners’ in France, Sarkozy Says – NYTimes.com.” Breaking News – The Lede Blog – NYTimes.com. The New York Times, 7 Mar. 2012. Web. 21 Mar. 2012..
Henry, Louis and Rolan Pressat. “Évolution de la population de la France jusqu’en 1970.” Population (French Edition), 10.1 (1955): 9-56. JSTOR. Web. 21 Mar. 2012. Hollifield, James. “France: republicanism and the limits of immigration control.” In Cornelius, Wayne A., Takeyuki Tsuda, Philip L. Martin, and James F. Hollifield. 2004. Controlling Immigration: A Global Perspective. Stanford: Stanford University Press. Print. Kepel, Gilles. The revenge of God: the resurgence of Islam, Christianity, and Judaism in the modern world. University Park, Pa.: Pennsylvania State University Press, 1994. Print. Kepel, Gilles. Allah in the West: Islamic movements in America and Europe. Stanford, Calif.: Stanford University Press, 1997. Print. Killian, Caitlin. “The Other Side of the Veil: North African Women in France Respond to the Headscarf Affair.” Gender and Society , 17.4 (2003):567-590. JSTOR. Web. 21 Mar. 2012. Kouri, Pentti J.K, Jorge Braga de Macedo, Alvert J. Viscio, Bernard Dumas, and Paul Krugman. “Aspects internationaux de la Macroéconomie de la France.” Annales de l’inséé 47/48 (1982): 85-115. JSTOR. Web. 21 Mar. 2012. Vallet, Louis-André. “Forty Years of Social Mobility in France: Change in Social Fluidity in the Light of Recent Models.” Revue française de sociologie, Vol. 42 (2001): 5-64. JSTOR. Web. 21 Mar. 2012. Viorst, Milton. “The Muslims of France.” Foreign Affairs, 75.5 (1996): 78-96. JSTOR. Web. 21 Mar. 2012. Wright, C. H. C.. A history of the third French republic,. Boston: Houghton Mifflin Co., 1916. Print.